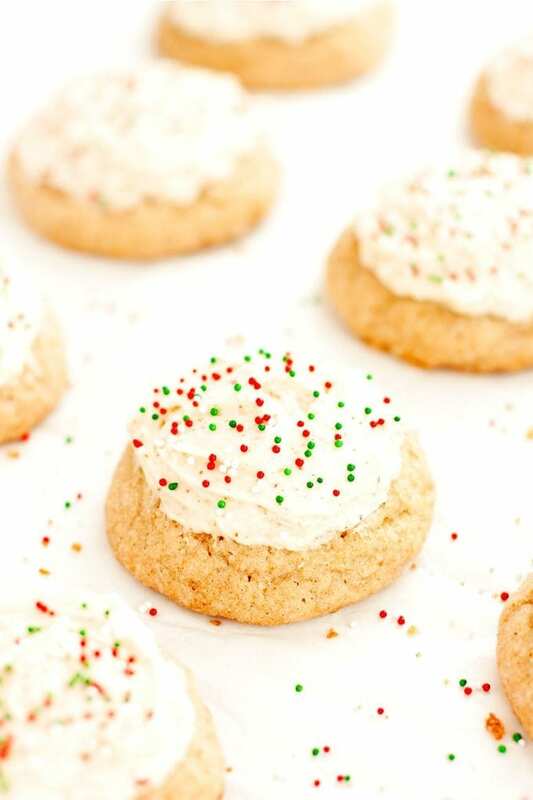 Eggnog cookies are a rich and creamy addition to your Christmas cookie tray. This cookie recipe has a soft texture in the center with nice browned edges. Plus, the frosting is packed full of nutmeg – just like topping a glass of eggnog with nutmeg! 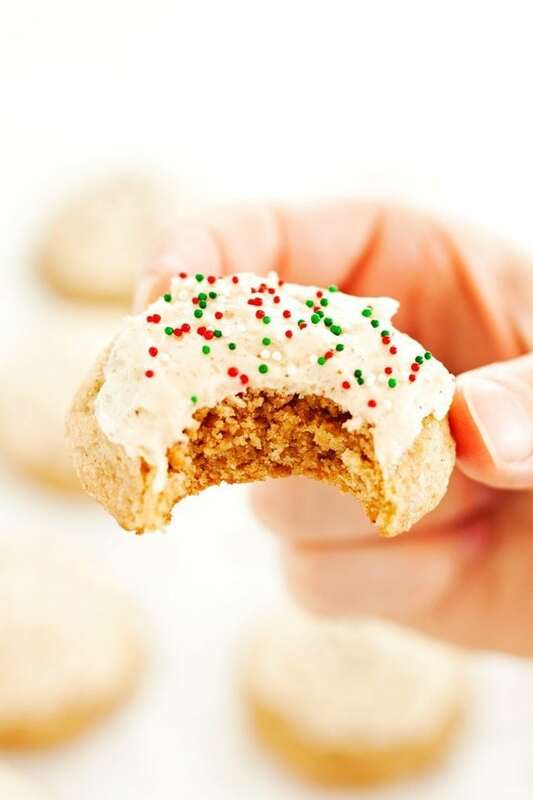 Top your eggnog cookies with nutmeg – in frosting form! There is nothing quite like sprinkling a dusting of nutmeg on a glass of eggnog. It gives the reach, creamy drink a wonderful spicy flavor. It tastes like Christmas in a glass. 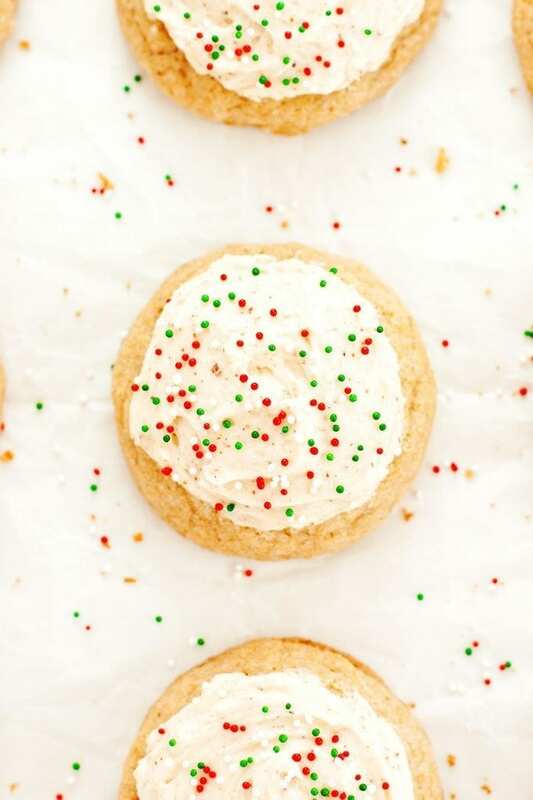 By frosting these eggnog cookies with nutmeg frosting you’re able to get that creamy, dreamy, spicy Christmas flavor in a delicious cookie form. Every Christmas, my father-in-law makes from-scratch, homemade eggnog, and its sooo good. He hasn’t yet divulged the secrets of this delicious concoction (though I suspect it involves a good dose of spirits), so I can’t share it with you just yet. 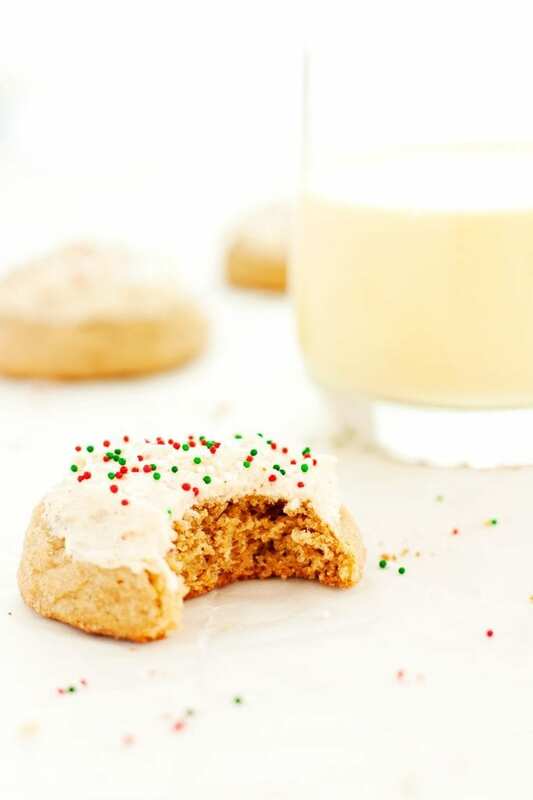 Perhaps I’ll have to try making these homemade eggnog cookies with homemade eggnog sometime soon. If you get a chance to try this yourself, let me know how it turns out in the comments. Fun fact: my in-laws live in Minnesota, and it never fails to be cold enough for my father-in-law to keep great big batches of homemade eggnog sitting outside. Festive! Speaking of rum, I enjoy a good splash pour of rum in my eggnog, and spicy, smooth rum goes just as well with these cookies! Simply increase the flour to 3 cups, and add 1/4 cup of rum right after adding the eggnog. Or try these other festive Christmas cookies recipes! 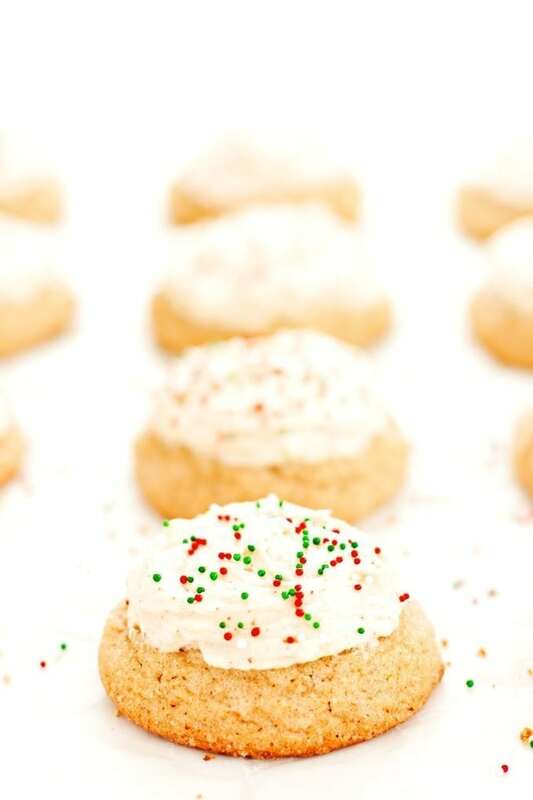 Rich, creamy eggnog cookies have a soft texture in the center with nice browned edges. Plus, the frosting is packed full of nutmeg - like topping a glass of eggnog with nutmeg! In a medium mixing bowl, whisk together flour, baking powder, nutmeg, cinnamon, allspice/clove, and salt. Set aside. Cream butter using a stand mixer or electric handheld mixer on medium speed, about 2 minutes. Add white and brown sugar and continue to cream until light and fluffy. Beat in egg yolks one at a time until blended. Add eggnog and mix until combined. With the mixer on low, gradually stir in dry ingredients until just combined. For thicker cookies, let dough chill for 30 minutes in frig. 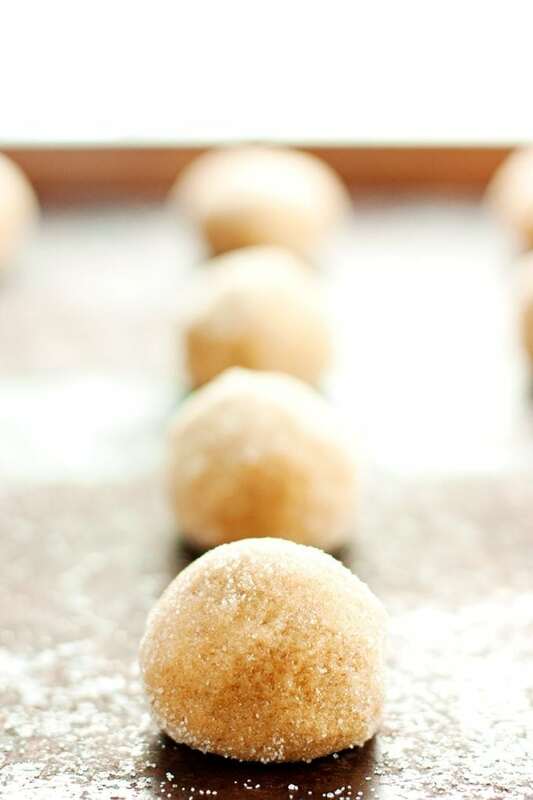 Once dough is chilled, preheat oven to 350 degrees F.
Form dough balls with about 2 tablespoons of batter. Roll in granulated sugar to coat (optional). Arrange on cookie sheet with about 2 inches between each cookie. Bake until edges of cookies are just set, middle will still be a little undercooked, about 10-12 minutes. Let rest on cookie sheet for 5 minutes, then cool completely on a wire rack. Once cookies are cool, prepare the frosting. Beat softened butter on medium speed with a stand mixer or electric mixer until smooth and creamy, about 3 minutes. Add powdered sugar, eggnog/milk, nutmeg, and a pinch of salt and beat on high until frosting is fluffy, about 1-3 minutes, scraping down sides when necessary. Add more eggnog if frosting is too thick and add more powdered sugar if frosting is too runny. Frost cookies, either by piping on with a frosting bag or spreading on with a knife. Sprinkle with extra nutmeg and sprinkles, and serve!